I shop too much, I know I do, but when I saw the work of Su at Quercus Silver it seemed like it was time to flex the PayPal account! Now that spring is on the way (just a touch of hopeful thinking…well the daffodils are poking their heads up) I seem to be wearing a few less layers and slightly lighter colours. 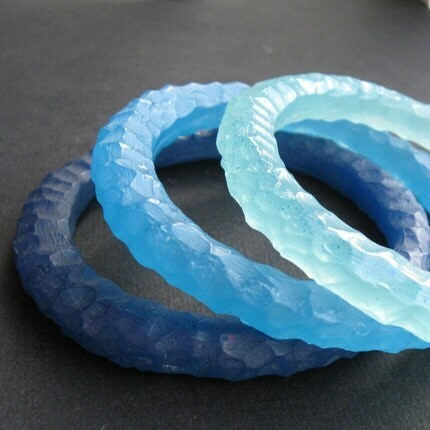 So I chose this fabulous set of bangles to brighten up a few cotton shirts….. I am so pleased with my purchase. The bangles arrived beautifully packed (always nice when you’re buying a gift for yourself) and they are even better in the flesh! Su has a great blog where you can see some of her work in progress. If you’re nosy like me then go take a look….